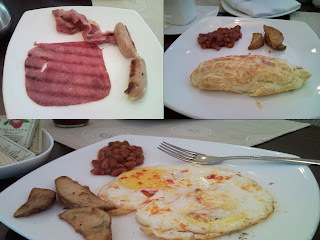 What better way to start my birthday celebrations than a breakfast buffet. Sudhakar and I have been dying to try one out. We wanted a continental breakfast buffet, a place that knew how to handle ham, eggs, bacon and the works. 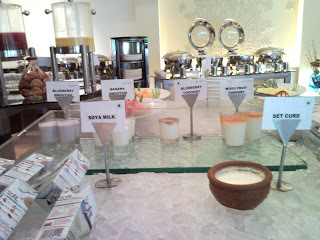 A little bit of research and we narrowed our options to Tom's opposite Johnson market and Stir at Taj Gateway. It was my birthday, so Stir seemed a better place to celebrate in. The buffet breakfast starts at 7 am here and goes on till 10.30, following which it is closed down for a while and then the brunch buffet opens up. 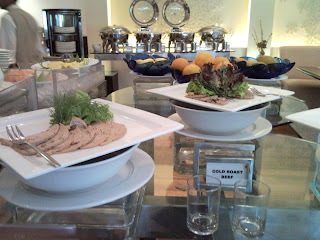 For Rs 366 a head all inclusive, the spread was lavish and well worth it. The ambience of the place is great, with them having an outdoor canopied seating arrangement as well. But since the food was on the inside, what better place to be. The oblong buffet starts of with all the trappings of a fresh salad laid out. Fresh sprouts, lettuce, cherry tomatoes and light dressings. 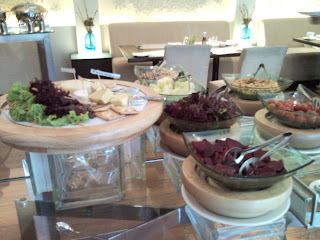 Next to that is the cheese platter with a variety of breads to go with it. Something to quench the thirst and milk-based - there was strawberry milkshake, lassi and another milkshake, the name of which I forget. This was followed by soy milk packets, set curd, and a variety of yogurts such as bluberry yoghurt, mixed fruit yoghurt, mango yoghurt. Interspersed with this was a platter of cold meats - cold roast beef, salamis of different types and more. 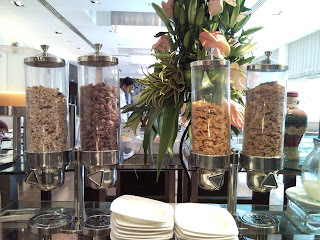 A walk around the table and you are face to face with mighty glass jars that house a variety of cereal - from muesli to chocos to bran flakes. The milk, garnishing and sugar are alongside. 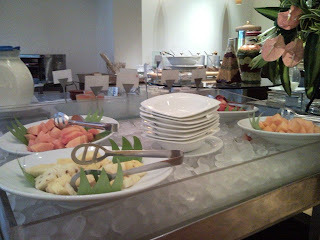 Continuing around the table, you come to the fresh fruit platter which is divided into cut fruits and whole fruits. Fresh oranges, bananas, papayas, watermelons just seem to beckon. Fresh, cold fruit juices are also lined up here. Facing this part of the buffet spread is an independent table which has a complete Indian buffet breakfast of upma, idli, sambhar and the works. 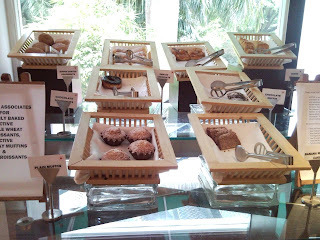 The opposite side of the buffet has an another table laid out with breads, biscuits and cakes of every nature. Yet another table holds the fresh bread of which you have the option of toasting on a turnstile toaster. At the live kitchen you can tell the chef just how you want your eggs, ham and bacon done and this will be brought to your table. Sudax opted for a double bullseye with seasoning and I asked for a ham and cheese omelette. Both dishes came with baked beans and baked jacket potatoes. This is also the counter at which you get your dosas.